Thomas’ physicality is one facet of his game that sets him apart from other prospective defensive backs of his size, especially given the fact that he’s been clocked as fast as 4.4 in the forty yard dash to go along with a 4.1 in the pro shuttle. The legs that help him cover and run with some of the top wide outs in 5A are the same ones that have also squat over 400 pounds and power cleaned as much as 235 pounds. Given Thomas’ measurables, it’s no wonder why he’s garnering attention from Division 1 schools throughout the country. 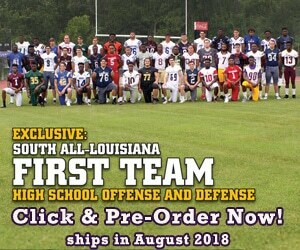 While he currently holds offers from local FCS school Southeastern Louisiana and Division 3’s Louisiana College, Thomas came across his first FBS offer in May. “I took an unofficial visit to Southern Mississippi in March. Coach [John] Simon toured me around the facilities and campus and I loved it. I received an offer from them in May”, said Thomas. While football is a large part of Thomas’ life, he understands the value of his education and plans to go into the field of business following his playing career. When he’s not on the football field or in the classroom, he also enjoys hanging out at home and playing NBA 2K, along with Madden on PlayStation and Xbox. There’s no doubt that Thomas will be a steal for whatever school he finally decides on signing his letter of intent to. His physical nature to complement his speed and athleticism has drawn comparisons to the likes of Tyrann Mathieu, the scrappy defensive back from LSU who currently plays for the Arizona Cardinals. Subsequently, it should come as no surprise that Thomas claims he models his game after the 5’9 Mathieu. “I model my game after him because people claimed he was undersized, yet he always plays fearless.” If Thomas continues to improve on his already sterling skillset, he just might find himself following in Mathieu’s footsteps. Nick is from Baton Rouge, LA where he attended St. Michael the Archangel and was a 3-year starter at Tight End for the Warriors. He was named to 3 All-District and 2 All-State teams at the 4A ranks. He earned a full scholarship to Nicholls State University where he was a 4-year starter and was named to 2 All-Conference and 2 All-Louisiana teams for the Colonels. He earned his degree in Mass Communication with a concentration in Broadcast/Journalism to go along with a minor in English.